Over the weekend my children and 2 of my nieces that were staying with us went out and picked me some of the remaining dewberries. 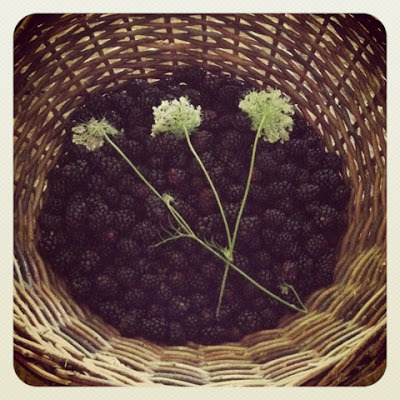 Remember Dewberries are very much like blackberries. They taste a lot like blackberries, but rather than grow up vines, they stay fairly low on the ground and spread out low, and the berries are a bit smaller. We have a good bit growing around on our property, but have missed the blooming a bit this year. When they brought me such a nice basket, I knew I wanted to put up at least a little bit of jam. 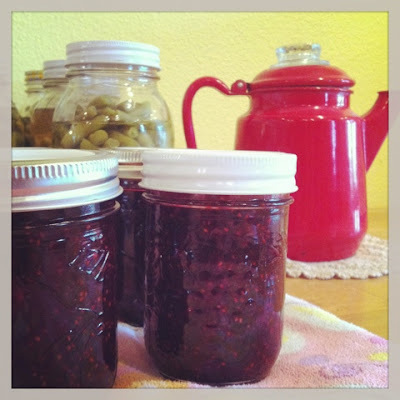 I've made a switch over to a low sugar alternative when making jam and this is how I did it. You can see the fruit begin to gel pretty quickly. I am fond of using the Pomona pectin because it has an indefinite shelf life! I'm using less sugar, so even though I am using more expensive organic sugar, I am still paying less than before! I am not being sponsored by Pomona pectin... I am just a satisfied customer. But! You can click on the link and order it from amazon and I am an affiliate with them. Enjoying your beautiful blog. Love everything you're doing on that homestead. Lovely.